The Tompkins Financial Advisors Investment Committee expects global growth to slow in 2019, due to several downside risks. Even though the S&P 500 marked its longest ever bull market in August of 2018, a sharp correction in October reminded market participants that we are closer to the end of the current cycle and that investors should be prepared for lower returns and heightened volatility. In light of these headwinds, there are several factors that have the potential to positively impact US stocks, including increased capital expenditures and higher government and consumer spending. Furthermore, now that Democrats have regained control of the House of Representatives, there is potential for a renewed emphasis on infrastructure spending. We do see adequate economic strength and earnings momentum in the United States, which may drive US equities somewhat forward, at least in the short- to medium-term. Our general view on Emerging Markets (EM) is that the asset class has been oversold in 2018, thus creating some worthwhile investment opportunities. EM valuations are roughly in line with their average levels since 2003. However, EM valuations relative to other markets are currently at all-time lows. This is even more evident for EM consumer related and tech sectors, which are much cheaper than their developed market counterparts. In our ongoing market due diligence, we have noticed inflationary pressures, but our base case assumptions do not include excessive wage growth in 2019. However, other imbalances (such as international trade tensions) could potentially cause disruption and nudge the global economy closer to a recession. With respect to the US-China trade tariffs, we can only hope that cooler heads will prevail in those negotiations. The potential costs of a down spiral in retaliatory tariffs could have far-reaching negative consequences. Our research shows that by simply increasing tariffs to 25% on all goods traded between China and the United States could shave as much as 1.00% off global growth, and as much as 2.00% off US and Chinese economic growth. With the mid-term elections behind him, Trump’s ambitions for a 2020 presidential campaign may lead him to accelerate trade negotiations with both China and Europe. To summarize, we see elevated geopolitical and policy risks, which might unsettle financial markets, especially toward the second half of 2019. Our view is that the economy in 2019 faces many more headwinds than last year. The past decade of more accommodative monetary policy is coming to a close as the Fed gradually moves closer to a “neutral” rate via higher interest rates and balance sheet normalization. Furthermore, we believe fiscal policy will continue to be a positive tailwind for US economic growth, although we expect its effect to be more muted than in 2018 as the deficit continues to increase. So far, trade policy has acted as a minor nuisance; however, we expect tariffs to cause a more notable drag on growth for both the US and its trading partners in the year ahead. The change in US policy and its effect on the American consumer cannot be overstated. To bring this into focus, consider the effect of the tax reduction that took place in early 2018. The total reduction in taxes for the US household sector was roughly $120BN. If 25% tariffs on Chinese goods are enacted in 2019, it would amount to a tax increase of more than $100BN, wiping out most of the benefits from last year’s tax stimulus. We do expect that most of that increase will be absorbed by currency adjustments and the bottom line of producers, both in the US and China. However, the total net effects do have the potential to meaningfully bring down purchasing power and consumer spending. When considering the private sector, businesses will also suffer from the consequences of waning policy support. Like the US household, US businesses have benefited from the 2018 tax stimulus, although a large portion of that stimulus may have been redirected to shareholders and not households through the form of dividends and stock buybacks. Tax reforms have greatly reduced the corporate after-tax cost of capital, but that benefit may begin to fade next year as long-term interest rates begin to increase. The combination of these factors, in addition to other variables, could potentially shift GDP growth below the 2.9% year-over-year experienced in 2018. The U.S. economy growth prospects remain highly sensitive to household income creation and access to credit. Real consumer spending appears to be on track to grow 2.8% year-over-year in 2018, which is similar to consumer spending growth in 2017. Given the notable income boost to consumers from the tax cuts that took place last year, we believe that merely maintaining the level of spending indicates that other drivers of spending growth have softened. It is unclear how much of the disposable income boost translated into increased consumer spending. Our view is that the tax cuts only caused a modest rise in spending. Furthermore, we feel that the biggest growth drivers resulting from the tax cuts are likely behind us. Depression. There are several theories as to why the wealth effect has disappeared. However, the implication of this phenomenon is that consumer spending may not be as sensitive to recent equity draw-downs, just as increases to household wealth have not produced an uptick in consumer spending. On the positive side, we note the relative health of the household balance sheet. Data suggests continued deleveraging, with debt-to-income ratio of 86.5% in 3Q2018 versus 87.5% exactly one year ago, and the 116.3% peak experienced at the beginning of the great recession. One potential explanation for this favorable trend may be stricter lending controls and more cautious lenders. Stricter lending standards may have lessened spending growth during the most recent expansionary phase; however, they have the potential to make spending growth less vulnerable at this stage in the cycle. Our expectation is for consumer spending to continue growing in 2019, albeit at a slower pace than the previous two years. The labor market’s continued improvements, along with household optimism, will likely support spending. On the other hand, fading fiscal stimulus and tightening financial conditions have the potential to offset some of that growth. Looking back at 2018, we noticed that the previous four quarters exhibited the fastest GDP growth the US has experienced since before the Great Recession. This has reawakened hopes that the US is coming out of the secular slow growth environment that has characterized the mid-2000s. However, based on our research, we feel that this outpaced growth is not sustainable going forward. GDP growth can be broken up into two main drivers: 1) trend growth in output per hour (productivity); and 2) trend growth in hours worked (strength of the labor market). The past decade has seen productivity increase at an excruciatingly slow 1.27% annualized pace. Moreover, the last four quarters have not proved to be any different, with economic data showing no clear signs of growth in output per hour. 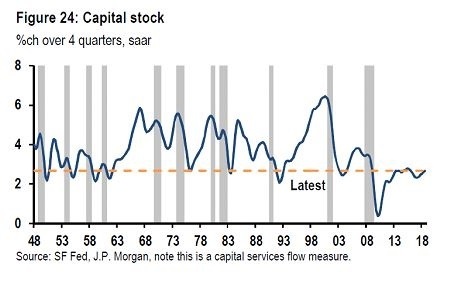 The one saving grace that could re-ignite prospects for faster productivity growth is faster growth in capital stock. The first half of 2018 saw capital stock grow at an annualized pace of 2.6%, which is almost 1% slower than the post WWII average. Furthermore, investment spending, which is positively correlated with change in capital stock, also shows signs of lackluster growth. Investment spending grew at a rate of 0.8% in 2Q2018, the slowest growth in almost two years. Lastly, the recent orders data for capital goods gives us no reason to believe a surge in capital spending is forthcoming. Developments within labor supply have been more positive in recent years. The Labor participation rate has basically remained the same over the course of the past five years, even in the face of morphing demographic trends that are putting pressure on participation. The return of American workers to the labor force in the past several years has certainly augmented the level of potential output. Moreover, participation rates for many demographic groups are returning to pre-crisis levels. It is evident that Yellen’s high-pressure labor market wager may have paid off. Looking back to 2015, the labor force participation rate for 25- to 54-year-old Americans has rebounded 1.5%, causing an approximate 1% increase to the economy’s productive capacity. Given the historically low unemployment levels, it will be harder to continue squeezing further growth gains from above-trend labor supply growth we have experienced thus far. Our view is that the moderate growth foretasted for 2019 should be enough to keep the labor market tightening. This past year has shown solid labor market conditions, with average payroll growth slightly above 200,000 jobs every month. This number is higher than the 2017 average job growth of 173,000/month and lower than 2014 peak expansionary period, which saw growth of 265,000/month. We believe that monthly payroll gains will begin to trend down in 2019 as the economy begins to wind down; our market estimates hover around 160,000/month for the year. That level of growth should be sufficient to keep the unemployment rate moving lower. Recent economic data points to core inflation almost reaching the FOMC’s 2% target. There are several factors that can meaningfully impact inflation. We feel that further tightening in the job market, albeit at a slower pace, will continue to add inflationary pressures to the economy. However, we do not believe that tightness in the labor market will lead to dramatically higher inflation next year, especially given the secular low wage growth we are experiencing. Other factors that can drive inflation higher next year exist, but primary concerns are centered on trade tariffs and their potential impact. Trade policy continues to be uncertain and in flux. Along with the rest of market participants, we are unsure as to the final outcome of the trade negotiations with China and also how much of the added costs from tariffs will be passed on to US consumers through higher prices (as opposed to added costs being absorbed by foreign producers and US corporate profits). Other important factors that could weigh on inflation in 2019 include: 1) the strength of the USD (which notably strengthened in 2018); and 2) the sharp decline in energy prices we have witnessed over the past weeks. The strong dollar has already dragged core import prices and will probably continue to drag on US core inflation as we enter 2019. Increases in gas prices earlier in 2018 were providing a boost to inflation, however, the recent drop in oil prices has quelled that inflationary pressure. We believe the most recent drops in oil prices will meaningfully affect headline inflation, especially earlier in 2019. The Fed will be watching closely to see how the evolution of wage gains and wage pressures translate into higher inflation. We believe the inflation outlook will define the policy path this year. Fed officials project core inflation will remain roughly in line with the central bank’s target this year. However, if wage-driven inflationary pressures materialize more meaningfully, the Fed will likely not hesitate to deliver rate hikes, despite increasing global risks, market volatility and trade tensions. It’s been a challenging environment for bond investors over the last several years, and it all comes down to interest rates—in terms of rates both staying low and rising. Low rates have meant less income from fixed income securities, while rising rates pushed bond prices down, lowering the value of the securities. While both low and rising interest rates will still be in play in 2019, we believe the worst is likely over. The somewhat higher interest rates we have now come with higher bond income; and although we think rising rates are likely, we think that upward pressure will moderate compared to what we’ve seen since mid-2016. Investors’ obsession with the flattening U.S. Treasury yield curve dominated headlines for much of 2018. A flattening yield curve occurs when short-term rates are rising faster than long-term rates, which may eventually lead to an inverted yield curve, where short-term rates are higher than long-term rates. Historically, this has been a negative signal for the U.S. economy, often providing an early warning of an eventual recession, which is why the yield curve has been garnering so much attention recently. We believe these concerns were overstated given the positive economic environment. We do expect both short- and long-term rates to gradually rise in 2019, keeping the yield curve somewhat flat. However, if that continues to occur in the context of solid economic growth and modest inflation, we don’t think a flat yield curve should be read as a signal of rising recession risk. Understanding what’s driving short-term rates higher provides further valuable context to the yield curve. Changes in short-term rates largely reflect Fed policy, and in 2018, short-term rates moved higher in anticipation of gradual rate hikes. We expect the Fed to raise rates only twice in 2019, roughly in line with the consensus and the Fed’s updated December guidance. Market forces may create conditions that enable the Fed to pause and reassess the rate hike path that best serves the economy. These forces include the lack of threatening wage pressures, delayed effects of previous hikes, policymakers’ awareness of the impacts of dollar strength, the impact of balance sheet reduction, and the increase in Treasury issuance (driven by deficit spending). The Fed’s recent emphasis on flexibility will allow it to be more responsive to market conditions. Taking all of these factors into account, we anticipate gradually increasing interest rates as U.S. economic growth moderates from the strong pace of 2018. We think the 10-year Treasury yield can move between 3.25% and 3.75% in 2019 if the Fed goes ahead with two rate hikes. We may periodically see spikes above or drops below, but we suspect the bulk of time will be spent within this range, as domestic and global investors attempt to find balance among Fed guidance, U.S. Treasury issuance, wage pressures, and relative valuations with other sovereign bonds. Tying back to the yield curve, the demand for U.S. Treasuries also points to the yield curve remaining flat. Because of its attractive valuations relative to other global sovereigns, the benchmark U.S. Treasury above a 3.0% rate often has experienced good demand when compared to other, more expensive developed market alternatives. Against this backdrop, we expect near flat returns for the Bloomberg Barclays U.S. Aggregate Bond Index. Given our expectations of rising interest rates, yet at a slower pace than in recent years, here is a breakdown of how bond sectors may perform in 2019. U.S. Treasuries: U.S. Treasuries do have high interest rate sensitivity, meaning that a sharp rise in rates could have a large and negative impact on total return. However, we believe it is important not to fully abandon this fixed income sector, because U.S. Treasuries can help provide portfolios with diversification, income, and liquidity, and can help smooth out volatility during periods of equity market stress. Munis: Despite 2017 tax cuts potentially weighing on demand, municipal securities performed better than we anticipated. We still view tax-exempt fixed income as relatively attractive for suitable investors. MBS: Mortgage-backed securities have a history of strong performance during periods of rising rates as prepayment risk diminishes. Mortgage supply has been weaker than expected in 2018, while the period of slow curve flattening helped minimize volatility in the space. Despite expectations that rising rates will moderate, we believe adding MBS over the coming year may help provide added diversification. Investment-Grade: As we move into the later part of the business cycle, we are increasing our focus on investment-grade fixed income. Up to half of the sector now carries a rating of BBB—essentially one notch away from being categorized as high yield. As a result, IG bonds may present unforeseen risk to investors who do not selectively choose companies with strong balance sheets and a predictable earnings stream. International: Developed market sovereign bonds continue to look expensive. Central bank policy has made yields unattractive and rising rates may become an additional challenge as the European Central Bank reduces its monthly asset purchase program. Emerging market debt, denominated in dollars, looks attractive when considered through the lens of relative valuation. While the 37-year-old bull market in bonds may be over, we’re not convinced a full-on bear market has begun. The income-generation (coupon clipping) phase of the credit cycle may last longer than in previous experiences, given the extent of monetary policy accommodation over the past decade. Nonetheless, we acknowledge that it will prove more difficult to make money in bonds going forward, as a variety of trends conspire to push market interest rates higher. Therefore, for diversified fixed income portfolios, we will try to employ active strategies to identify fixed income investments that may perform better in an environment of rising rates, dollar strength, and fiscal stimulus. The current bull market is officially the longest in history, and the economic expansion is quickly approaching that milestone as well—it’ll be the longest expansion ever as of May 2019. So what does age have to do with it? Considering that, on average, the typical bull market and expansion last approximately 5 years, reaching the 10-year mark is quite a feat. But for those who are concerned that the cycle has gone on too long, there is some interesting context to consider. Assuming the start of the current bull market began after the lows achieved in March 2009, then it is the longest in duration, but not magnitude. While the current bull market has exceeded the 10-year life of the 1990s bull, that period generated returns in excess of 400%, compared to the current more than 300% return. Yet in late summer and early fall of 2011, the S&P 500 Index fell by 19.9%. Some could suggest we’re splitting hairs here, but it sure felt like a bear market! Though volatility is a characteristic of a late cycle stock market environment, in our opinion, corporate profitability is the most important determinant of equity prices. Though profits rose by approximately 25% in the first three quarters of 2018, and growth of more than 20% is expected for the full year based on FactSet consensus estimates, concerns have escalated that profits may have peaked. Investors must make the distinction that, while the rate of growth in profits may have peaked, absolute profits remain at record levels and are expected to rise. Also, a look back at the past 10 profit cycles reveals that after a peak in the year-over-year profit growth rates, it has taken about four years before the economy slipped into recession. What’s more, equity prices climbed by an average of more than 50% during that intermediate period. Clearly, peak profit growth does not indicate the cycle is nearing its end. In reality, we can’t say for sure how long this bull will keep running, but given the fundamentals of the U.S. economy and corporate America, we believe the odds favor solid potential gains for stocks next year. Against a backdrop of steady economic growth, strong corporate profits, and a rising rate environment, here is a high-level look when it comes to positioning for 2019. Large VS. Small Cap: Small caps generated out-performance early in 2018, aided by being relatively more insulated from trade tensions than large caps. However, as trade issues mitigate, the business cycle ages, and the dollar’s uptrend potentially hits resistance, market leadership may shift back toward large caps. In addition, a rising interest rate environment, potentially with tightening financial conditions, may create a challenge for small cap companies that have higher costs of capital and a greater reliance on debt. Accordingly, we favor large caps over small caps in 2019. Growth VS. Value: We maintain our slight preference for value despite its under-performance relative to growth in 2018. We expect value in 2019 to benefit from the pickup in economic growth that began in mid-2018, and relatively attractive valuations after a sustained period of growth out-performance. Emerging VS. Developed Markets: We favor EM equities over developed international equities for their solid economic growth trajectory, favorable demographics, attractive valuations, and prospects for a U.S. trade agreement with China, with a bias toward emerging Asia. Growth in Europe has been slowing and may struggle to reach 2% in 2019, while growth in Japan is also lagging, despite stimulus and corporate reform efforts. GDP growth in China and broader EM may more than double the pace of developed international economies in 2019, supporting better earnings growth, and we believe political uncertainty is actually lower in EM than in Europe. Overall, we think 2019 can be a good year for stocks. Like 2018, however, we expect volatility to remain as the business cycle ages. We recommend investors weather these ups and downs by diversifying portfolios where appropriate. We believe stocks may find support from continued steady growth in the U.S. economy and corporate profits as the impacts of fiscal stimulus continue to flow through. We continue to look for any signs of weaker economic or profit growth that could drag stock prices lower. Potential escalation in U.S.-China trade tensions, including more and higher tariffs, remains a key risk to corporate profits and therefore global stock markets in 2019. In 2018, Emerging Markets were hit by a series of idiosyncratic, country specific shocks. Moreover, tightening financial conditions have put pressure on companies with the greatest external exposures (i.e. large exporters). Although the series of events that unfolded was not widely anticipated by market participants, we see room for recovery, especially within EM equities. The Chinese economy remains resilient for the time being, EM fundamentals remain generally robust, and finally, we may have reached a turning point with respect to several idiosyncratic risks. Some of the downside risks in 2019 include: escalating trading frictions in the way of tariffs, outsized portfolio outflows, and an overly hawkish Fed driving up global interest rates and the USD. A stronger U.S. economy continues to bolster G7 gross domestic product growth. Moreover, although near-term global growth prospects remain positive, there are persistent and elevated uncertainties that could potentially derail economic growth. Investor sentiment has shifted meaningfully and correspondingly, the consensus estimates for G7 growth have pulled back, creating the opportunity for upside surprises. On the negative side, trade tensions show no clear signs of alleviation, and have the potential to disrupt supply chains, increase price pressures, and further damage confidence. The Fed continues to push rates closer to a “neutral” level, but concerns loom that policy may become too tight. Tighter financial conditions have played out through a stronger USD, which has intensified the troubles of the most vulnerable EM economies. Going forward, further trade frictions and the future trajectory of the USD will prove to be a deciding factor for the asset class. Higher US rates may also pose a problem, by creating additional competition for capital, especially now that investors are receiving better returns in U.S. short-term bonds without having to take additional credit risk and/or duration risk. Given these new market dynamics, investors are beginning to reset their return expectations higher for EM assets. This repricing has ignited more market volatility, which reinforces the view that higher quality exposures across both EM equities and fixed income would benefit portfolios with meaningful allocations to EM. The majority of EM economies are holding up. Countries suffering through recessions, such as Turkey and Argentina, should have limited impact. We believe that China is the linchpin for transmitting growth to the world stage, and furthermore feel that the data points to steady economic activity in China. In a worst-case scenario the Fed tightens too quickly, the USD gains significant strength versus EM currencies, trade tariffs worsen, and lastly, portfolio outflows from EM spur a liquidity crisis and further EM tightening. We feel that the more likely outcome will be that these risks are already more or less priced into the market, especially for EM equities. In fact, global financial conditions may not tighten more than present levels. With the Fed moving steadily close to a neutral rate that will not help or hinder growth, we could potentially see a subsiding of individual EM crises. As a point of relative comparison, it is worthwhile to look at other periods of time when EM weakness bled into broader markets. Emerging markets make up about a quarter of global GDP growth, up from about 20% in 1997. EM stocks are already down as much as they were the last time their weakness weighed on U.S. equities. It took a 37% correction in 1997-98 before EM stock declines bled into the U.S. equity landscape. Furthermore, just a 20% correction was needed before the U.S. market turned over in 2015. The MSCI EM equity index has dropped 11.96% from January (as of 9/30/2018). The sell-off in EM fixed income assets has been uneven across the credit spectrum. 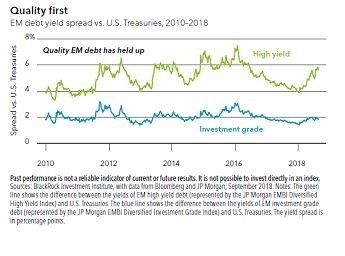 Yield spreads in High Yield EM sovereign debt has soared, while a closer look reveals that investment-grade EM debt has fared significantly better. Furthermore, the drawn down to date has been focused on a small group of higher-yield problem names. The end effect is that there may be some bargains in the high-grade EM issues that still show strong fundamentals and have simply suffered from a systemic EM selloff. We have yet to lose confidence in EM equities. We see economic strength beginning to transition into sustained growth for the first time in more than 10 years. Furthermore, consensus estimates back in September point to EM stocks EPS growth of 12% for 2019, underpinned by China’s projected growth of 16% (according to Tomson Reuters). This compares favorably to the forecasts of 10% EPS growth for US stocks. The recent selloff has restored a lot of value, with EM stocks trading at a meaningful discount to DM equities. EM value stocks may be particularly underappreciated compared to names with more growth characteristics. Given the strong fundamental story that accompanies several EM names, there may be pockets of opportunity for discerning investors in 2019. But what exactly is fueling EM earnings going forward? A big part of that story is the changing sector compositions with EM. We have seen a wave of new offerings in higher profit sectors; a trend which we feel is unlikely to reverse. Take the technological sector, for instance. This sector within EM has ballooned in size from 4% to 28% of the MSCI EM Index over the past two decades. Technology stocks have lead EM lower in 2018, amid tighter regulations in China and the potential for trade tariffs to upset global supply chain networks. However, it is important to not lose sight of the fact that EM tech valuations, relative to DM tech, are among the lowest seen in the past 10 years. We see this as yielding attractive investment opportunities across the EM equity landscape. There's little slack left in the euro-area economy and that's beginning to show up in pay packets. Stronger wage growth will eventually filter through to underlying inflation, helping it inch up toward the European Central Bank's target. While growth has slowed materially toward the end of 2018, business surveys across the euro-area all point to a slowdown in growth toward the end of 2018. That confirmed a loss of momentum in the region relative to 1H and suggests the slowdown in 3Q and 4Q may be more than a blip. The biggest risk to the outlook is Italy, where there’s a standoff between Rome and Brussels, just as the economy flirts with recession. 2019 will see the ECB withdraw monetary stimulus, but the heavy debt burden means it will tread carefully. The ECB has called time on quantitative easing; asset purchases are down to 15 billion euros a month and coming to an end. Growth has slowed, but it would take a huge change to the outlook for asset purchases to be extended. It's reasonable to expect a small increase in the deposit rate in the later part of 2019. A lot could happen between now and then. A failure of wage pressure to translate into higher inflation, a blow to trade, or a disorderly Brexit could all lead to a delay. China's economic growth slowed toward the end of 2018, even though the impact of trade war is yet to kick in. Downward momentum continued toward the end of 2018, albeit at a gradual pace. Funding conditions remain tight despite monetary easing. U.S. tariffs on $250 billion worth of Chinese imports are in place, and trade talks have come to a complete impasse. China is lining up monetary and fiscal policy to provide support for growth. The government has announced plans for boosting bond financing for private firms and cutting taxes for households. We believe the final figures for 2018 will come in close to the government’s 6.5% target, and pro-growth policies are likely. Beneath China's incremental slowdown, structural changes continued apace, pointing to further progress on rebalancing. A breakdown of the GDP data by industry showed growth outperforming in information technology, leasing and other parts of the new economy, and underperforming in more traditional sectors like finance and real estate. It's still early days in the trade war with the U.S., but the message appears to be that China is still pressing ahead with structural reforms, even as external risks grow a positive for longer-term growth. Japan's economy faces challenges, ranging from U.S. protectionism to a looming sales-tax hike and Prime Minister Shinzo Abe's incomplete structural reform agenda. Fiscal stimulus, continued monetary easing, and a mild yen decline should help extend a growth streak in 2019 to seven years, if at a slower pace. Even so, the costs of supporting growth now mean payback later. Higher spending will require deeper cuts ahead to get debt under control. Financial imbalances building up as a result of the Bank of Japan's extreme easing will come back to bite. Reforms in the labor market and other areas are needed for long-term growth. Sustaining momentum hinges on an absence of shocks from risks spanning the U.S.-China trade war to moves in oil prices. The 2020 Olympics will put the spotlight on Japan and pressure on Abe to deliver. The Bank of Japan appears to have little choice but to keep stimulus flowing, with a weaker inflation outlook and increasing risks to growth from a U.S.-China trade war and a slowdown in China. At the same time, financial imbalances continue to build as a result of its extreme easing, and these could deepen a downturn in the event of a shock. The annualized growth rate for 2018 is likely to come in significantly slower than the 2.5% recorded in 2017. Such strong growth could not be sustained and growth is now close to the trend rate for Germany. The slowdown appears to reflect the roll out of new vehicle emission standards, which have disrupted auto production. Though this will have a material effect on growth, we expect the services sector to have performed better. Indeed, the services PMI has climbed significantly in recent months as the manufacturing component has slipped. A bounce back is likely in 4Q. Germany's recovery from the global financial crisis and the euro area's sovereign debt episode was swift. And with monetary policy loose, the economy seems likely to hold up relatively better than other developed countries over the next few years. Still, it is taking time for labor market tightness to translate into cost pressure there are only tentative signs in the prices data of an underlying pick up. An aging population has so far been made good by inward migration and increasing participation in the labor market. In time, those influences will become smaller and potential growth is likely to slow. Growth is expected to slow in the near term as Brexit uncertainty weighs on spending. In 2019, assuming the U.K. and the EU agree a deal, the economy should expand above trend thanks to a number of cyclical tailwinds. The boost to the economy is likely to come from three sources: a less restrictive stance of fiscal policy; a real income lift as the rise in the pound associated with a deal helps slow inflation; and more certainty about the future. While that's likely to keep upward pressure on wage growth, it's unlikely to prevent inflation slowing as the effect of sterling's depreciation fades. The Bank of England lifted rates in August, and the next move should come in May 2019. The biggest risk to the outlook is the possibility that the U.K. leaves the EU without a deal. However, risks exist even in the event of a deal. For example, the world economy may fail to provide as much support to growth as we expect. There are also upside risks associated with household consumption potentially outpacing income gains. The economy is starting to slow down under pressures of excessively tight central bank policies, the drag from which is likely to linger during the current fiscal year. Still, the appointment of Shaktikanta Das as the new governor holds promise of a course correction ahead. Together with the collapse in global oil prices, this has boosted investor confidence and is expected to put the economy back on a gradual recovery path. Looking ahead, market participants expect weak inflation and fading growth to drive the Reserve Bank of India to a rate cut in February from its current stance of calibrated tightening. Expectation of lower interest rates and a tailwind from structural reforms should also support recovery next year. Political uncertainty in the 2019 elections will be a key risk to market sentiment. Growth is cooling in most of the Asean-5 and likely to cool further in 2019 due to headwinds from exports and higher interest rates. Inflation remains low (except in the Philippines) and is likely to remain in check thanks to benign demand-pull pressures and proactive tightening by monetary authorities. Exports have been more of a headwind for Singapore's open economy. Household spending has been an issue in the region's more closed economies the Philippines and Indonesia. Bucking the trend, at least in 2H, may be Malaysia, thanks to a post-election boost in sentiment and an aggressive tax cut. The Association of Southeast Asian Nations' five largest members Indonesia, Malaysia, the Philippines, Singapore and Thailand have different sensitivities to oil prices, Federal Reserve rate hikes, China's reforms, and adversarial U.S. trade policy, the main external challenges. After four harsh years, Brazilian growth is likely to pick up in 2019 to around 2.5%, based on consensus. Lackluster activity (around 1%) in 2017 and 2018 was not sufficient to offset the 8% plunge during Brazil's longest and deepest recession over 2015-16. This leaves ample economic slack, which may last until the end of 2020 and will help to keep inflation low. Growth in 2019 will hinge on three main factors: adoption and maintenance of a sound economic policy by the new president; the advance of fiscal reforms in Congress; and the external environment, particularly U.S. rates, commodity prices and turbulence in other emerging markets. Risks to the growth outlook will depend on the progress of these factors, which influence the currency, interest rates and confidence, as well as the uncertainties that surround them. The biggest challenge for the Brazilian economy is to stabilize its public debt, now close to 80% of GDP. That will require a fiscal adjustment in the order of 3%-4% of GDP. There is no need to do the adjustment in full at once; most of the public debt is domestic, BRL-denominated and its average tenor is four years. The national treasury holds a substantial liquidity cushion, and the local market seems accepting of a gradual adjustment, as long as there are firm signs that the adjustment is forthcoming. South Korea's economy is heading into 2019 facing multiple headwinds. At home, an anemic labor market and weak investment are weighing on growth. Abroad, weakening external demand and a U.S.-China trade war are threats to its exports. A record budget proposal for 2019 and measures to spur investment and consumption from the Moon administration may help balance out those drags to growth. The consensus forecasts put GDP growth at 2.7% in 2018 and 2.65% in 2019, down from 3.1% in 2017 and below the five-year average of 3%. That is in line with the Bank of Korea's estimates. The central bank trimmed its growth forecasts for both 2018 and 2019 to 2.7% during its quarterly economic assessment in October 2018. In spite of rising growth risks, the Bank of Korea has rolled back some of its monetary support with a policy rate hike in November 2018. Its aim is to rein in financial imbalances from an extended period of low interest rates. The central bank is now set for a long pause. The direction of its next move could be up or down depending on how strong headwinds to growth become in the year ahead. In closing, given the maturity of the current cycle, we would suggest more cautious positioning with respect to higher risk assets, with a diversified allocation to more defensive equities, higher quality credit, and selective investment within Emerging Markets. Lastly, a meaningful allocation to liquid alternatives may prove a valuable portfolio addition, dampening volatility and adding to uncorrelated returns. If you have any questions regarding your investment portfolio or would like to learn more about our investment strategies, please contact your local Tompkins Financial Advisor or Trust Officer.